Amazing Spider-Man #13 is out 1/16/2019. By Zack Quaintance — Amazing Spider-Man #13 continues an interesting trend I’ve noticed throughout this young: it continues to take Spider-Man continuity deep dives and translate them into new stories. This is not all that novel of an approach for stories about decades-old characters. It is perhaps a bit less common at Marvel (where characters are generally a bit younger), but over at the distinguished competition, writers like Geoff Johns and Grant Morrison have told some of our best modern comic stories by plumbing the continuity depths and teasing old ideas, concepts, principals to the surface. That notion is one that’s been evident multiple times throughout Nick Spencer and Ryan Ottley’s still-nascent Amazing Spider-Man run and is evident yet again this week with Amazing Spider-Man #13. 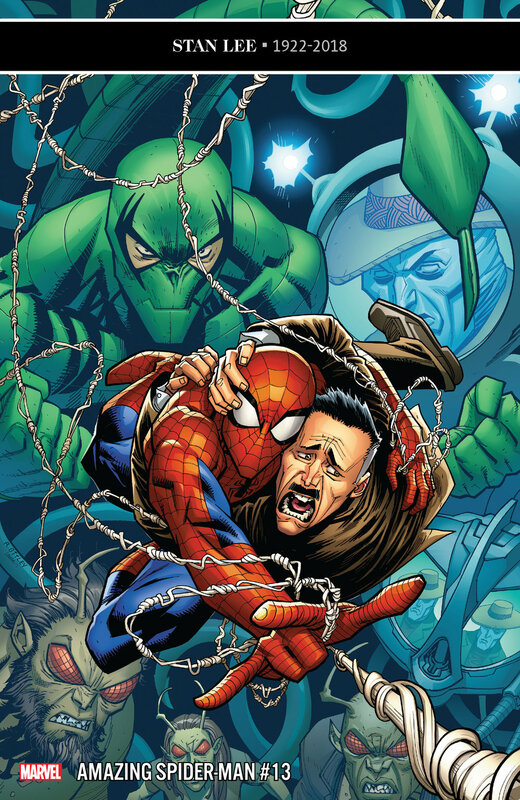 In this issue, the big bad who’s been tormenting both Spider-Man and his foil-turned-friend J. Jonah Jameson since issue #11 is revealed to be Frederick Foswell...Jr., who is the son of Frederick Foswell, Sr., a Daily Bugle reporter who once nearly pulled off a successful investigation of Spider-Man’s true identity before becoming way too close to his sources and ending up as a crime boss. Indeed, Foswell made his first appearance all the way back in Amazing Spider-Man #10 (1964), created by Stan Lee and Steve Ditko themselves. Like many characters, Foswell has popped up here and there through the years, most recently in previous writer Dan Slott’s Dead No More: The Clone Conspiracy storyline, having his evil Big Man alias in story as a clone. This issue, however, takes his life and death a bit more seriously than prior appearances, having his son return to get revenge on Spider-Man, motivated as he is by J. Jonah Jameson’s now-gone hatred for the hero. And you know what? I really liked all of that. It was a nifty way to accomplish the dual feats of A. giving Spider-Man a relevant foe to battle for a few issues, and B. continuing Jameson’s growth arc and transition from Spider-Man hater to someone who’s now seen the error of his ways. Heck, in this issue Jameson publicly admits to having been a bad journalist for all those years. For long-time Spidey fans and readers this is no small thing. It won’t garner the headlines the same way something like giving Aunt May cancer does (see Friendly Neighborhood Spider-Man #1), but from a character growth standpoint it’s really much more impactful and rewarding to careful readers, to all of us who have rolled our eyes at Jameson so thoroughly eviscerating Spider-Man’s public image no matter how heroic he proves himself to be. I know for me—a nigh life-long Spiderman fan and a professional journalist by trade—I’ve found his constant inflammatory editorializing frustrating as all get out. To see him grow away from that (even at personal cost for himself) was just so much more compelling than killing or maiming the character. And so far, that’s really what’s marked this run: characters moving at deliberate pace towards moments of growth and emotional honesty. Pepper in some of Spencer’s pithy humor and a seemingly-irrepressible desire to use every last Spider-Man villain ever, and this continues to be a fantastic run for Marvel’s flagship character.